One of my top 3 games of all time, Star Control II a perfect storm of sci-fi gaming delight. It never should have worked. Take the sprawling, galaxy wide story akin to Babylon 5 or Deep Space 9 and play it like Hitchhikers' Guide to the Galaxy. From the outset, you know Ur-Quan Masters is something special. You travel home to Earth in a shiny new Precursor starship ready to help out in the war only to find out it’s over. Worse, Earth and her alien allies lost and the evil Ur-Quan rule the galaxy. Within the first couple hours of game time, you will have traded barbs and bombs with no less than four races as you begin your quest to assemble a new alliance in hopes of freeing the universe. Propping up this epic story are adventure game style interactions with over two dozen alien races, complete with unique voice acting and musical themes. Every alien oozes personality (sometimes literally). Scenarios range from first contact with the suspiciously nonsensical Orz, to the herculean task of repopulating a race of kamikaze Ewoks, Ur-Quan Masters brings a galaxy’s worth of Star Trek as written by Monty Python. Combat is so good it is available as its own mode from the main menu. Back in ‘the day’ many StarCon 2 players never even tried the single player adventure game, instead opting to strictly play others in the Super Melee mode. When it was originally released, Star Control II was considered a lengthy game of moderate difficulty. By modern day standards, The Ur-Quan Masters is a colossal and challenging title. Turn the difficulty down to easy (change at any time), grab a walkthru, and be prepared for a couple of false starts while you learn the ropes. No mouse support, either. 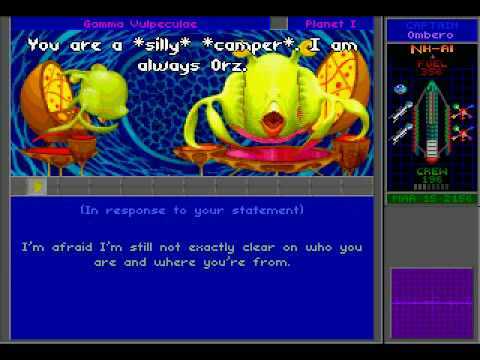 The freeware 3DO port/remake, The Ur-Quan Masters, is undoubtedly the definitive version of Star Control 2. It features support for both keyboard and gamepad, a full suite of graphic options, and an optional ‘remixed’ soundtrack. Ur-Quan Masters is available for Windows, MacOS X, Linux, BSD, and, in case that’s not enough, you can even get the source code.